Villa with private entrance surrounded by the beautiful Mediterranean pinewood.Built with high-quality materials such as granite, wood and Sardinian tiles. Spacious and comfortable.Functional and elegantly decorated.In a lovely and quiet location.Perfect for families or groups of friends.Equipped with a wide common swimming pool, sunbeds,sun terrace and small bar. 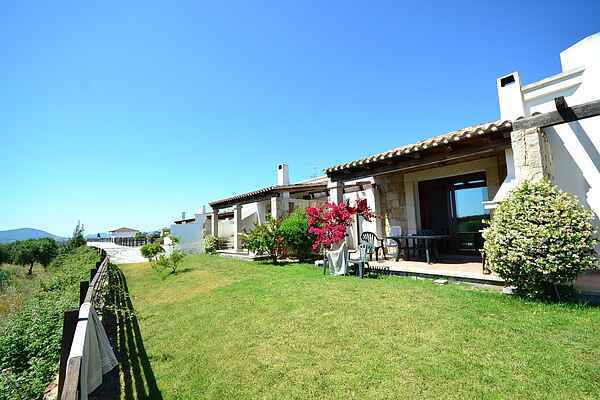 Located just 2 km from Alghero,in a panoramic position,offering a breathtaking view of CapoCaccia Bay. Created protecting the environment and placed in a context of well kept gardens and surrounded by ancient olive trees. The nearest beach is Lido which is about 3.5 km away.In a few minutes drive you can reach some of the most beautiful beaches in Sardinia: Mugoni and Lazzaretto. Alghero,lively and ancient city of Catalan origin provides endless opportunities for any kind of need. In the area you will find archaeological sites, nuraghi,necropolis for archeology enthusiasts, nature reserves, the fine food and wine. ANIMALS: allowed, excluding common areas. The town of Alghero, full of history, with its Catalan origins palpable in architecture, language and culture, offers endless opportunities for any kind of need.Famous for its beauty, antiquity and culture. Surrounded by sandy beaches and beautiful bays such as those of Porto Ferro and Le Bombarde. In the area you will find archaeological sites, necropolis and nuraghi for archeology enthusiasts; several nature reserves; the famous caves of Neptune and beaches among the most beautiful on the island; the fine wine and renowned cuisine; for lovers of the nightlife, numerous pubs in the old town and various nightclubs. You can book tours to the Park of Porto Conte and the Caves of Neptune.